Shenphen Dawa Rinpoche (Tib. གཞན་ཕན་ཟླ་བ་, Wyl. gzhan phan zla ba) (1950–2018) was one of Dudjom Rinpoche's sons and main holders of the Dudjom Tersar lineage. Shenphen Dawa Rinpoche was born in Kongpo, Tibet on February 17, 1950. He was recognized by Karmapa Rangjung Rigpé Dorje as the reincarnation of Taksham Tulku, a famous Nyingma tertön master, who discovered many teachings, and also of Tulku Pema Yeshe, an emanation of Khengen Tulku, the father of Dudjom Rinpoche. What happened is that my father Dudjom Rinpoche didn't want me to go back to the Taksham Monastery. His reason was that at Taksham Monastery, at that time, there was not so much harmony between the lama and the monks. Because of disturbances in the monastery, all the Taksham lamas’s life was not long. The reason Karmapa Rangjung Rigpé Dorje had to recognize me was that he was an arbitrator. The monks that came to get me from Taksham monastery had definite indications that I would be born as a son to Dudjom Rinpoche, and to my mother - they were given the locality and everything. According to the Tibetan government, if you belong to a specific monastery, you have to go to that monastery. Parents do not have the right to hold the child back. So in my case they [The monks from Taksham Monastery] wanted me to go to that monastery. Later, they agreed that if Karmapa Rangjung Rigpé Dorje would intervene and divine, then whatever he said would be the final word. So on that ground, my father Dudjom Rinpoche requested Karmapa Rangjung Rigpé Dorjeto recognize me as the reincarnation of Tulku Pema Yeshe, which I also was, and recognize another boy as the Taksham Tulku, in another locality. Shenphen Dawa Rinpoche was so also recognized as an incarnation of Tulku Pema Yeshe, who was himself an emanation of Khengen Tulku, the father of Dudjom Rinpoche, the grandfather of Shenphen Dawa Rinpoche. That is why Dudjom Rinpoche used to say that ‘he had already seen me [Shephen Dawa Rinpoche] change in three incarnations’: Khengen Tulku, Tulku Pema Yeshe, and Shenphen Dawa Rinpoche. As the only son of Dudjom Rinpoche’s second wife Sangyum Rigdzin Wangmo, Shenphen Rinpoche was not sent to the Taksham Monastery for training, but instead, was personally raised by his father. Dudjom Rinpoche trained him in all aspects of Vajrayana meditation and medicine. According to Shenphen Dawa Rinpoche, ‘Dudjom Rinpoche already had [received] a prophecy as to my training, and particularly where I should be and so on. It's very lucky that I went to India, and was able to come out here. If I had been given to a monastery, I think I'd still be stuck in Tibet’. I have a very fresh memory of all that, somehow. I remember fortunately enough meeting Namgyal Drolma, Dudjom Rinpoche's mother, before leaving Tibet. At that time I must have been only two or three years old, but I remember meeting her, staying with her at a restaurant. In India, Shenphen Rinpoche attended a Catholic school and a Protestant school. He received his Bachelor degree in English from St. Josephs College in Darjeeling, India in 1971. He received the highest level Doctorate degree in Tibetan Philosophy and the five Sciences. He received instruction from Khenpo Lachung, the Chief Abbot of Mindroling Monastery. 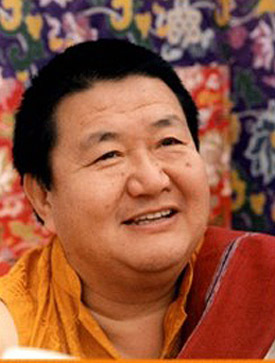 Shenphen Dawa Rinpoche's mastery of the English language and insight into western culture has established him as one of the foremost precious teachers in the East and West. He has focused many of his practices and teachings on the Tsa lung tikle practices. Currently he has followers with monasteries and retreat Centers in Tibet, Nepal, India, Bhutan, United States, France, United Kingdom, Spain and Switzerland. Katok Situ Rinpoche who lives in Bhutan. From his marriage to Sonam Chokyi, he has two daughters: Dechen and Tseyang. ↑ Continuity of aspiration, an interview with Shenphen Dawa Rinpoche, interview conducted for The Shambala Sun, 1988. This page was last edited on 27 January 2019, at 01:25.